After the death of Marin Marais in 1728, the public caché of the viol generally declined. There were those, though, who saw it as a bastion of French pride against the incursion of the Italian harpsichord. Indeed, as late as the 1740s the viol still had many great players – including Antoine (father) and Jean-Baptiste (son) Forqueray. The former, Forqueray senior, was born in Paris in 1672. A child prodigy, he played for the king in 1689. His music contrasts with the mellow harmonies of Marais: it has more individual "sparkle", unashamed love for an at times Italianate – at least an intricate – melody. It's also possible, perhaps, to detect the hesitancy of a man as socially disturbed as we know Antoine Forqueray to have been… persistent abuse of his wife, and of his son, whom he had imprisoned then exiled in 1725 in order to remove (potential) competition. One of the longest pieces on this enjoyable set of three CDs, "La Clément" the second piece of the Fourth Suite [CD.1 tr.2] seems to be posing more remorseful questions than it is making unambiguous assertions. In fact, it is in the many slower, reflective, often doleful movements that we see most deeply into Forqueray's troubled soul. In fact, you'll be disappointed if you're expecting three hours of superficial or playful French chamber or Court delicacy. Rather, this is yet another imaginative release from the ever enterprising Aparté label, which was founded as recently as 2010 by Nicolas Bartholomée, now the director of Little Tribeca and who founded both Musica Numeris in the late 1980s, and Ambroisie in 1999, which was later sold to Naïve Records. For this is all very thoughtful music, full of pathos, doubt, labor and reticence. That we hear also elegance, even-handedness and brilliance, and that as much light is made available to illuminate the darkness is due to the fact that violists Atsushi Sakai and Marion Martineau with the extremely accomplished and versatile clavecin and harpsichord specialist, Christophe Rousset, seem to have decided thoroughly to immerse themselves in Forqueray's unusual world, truly to have pushed and pulled until performances of sympathy, grace and persuasion emerge, from what could – if mistreated – have become routine and pedestrian. At the same time, none of these three players, whose ensemble work is as smooth and passionately virtuosic as their solo playing, runs the risk of letting the music smack of proto-Romanticism; or of giving its articulation an undue emphasis on individual anguish. Or joy, for that matter: not all Forqueray's works here are subdued… listen to the "La Ferrand" of the Third Suite [CD.2 tr.1], for instance, to hear uplift, spirit and hope. Yet in neither case does mere "charm" or lattice-work take the place of substance. Marin Marais, surely the more familiar figure from the period to most listeners, is probably richer and more integrated in his palette. But Forqueray evinces a desire to be studied. Indeed, these works are approached here more as studies, than exposition. This is most definitely not to say that they are offered as dry, exploratory exempla of the music of the period. Rather, Sakai, Martineau and Rousset seem fervently to believe that there is so much of substance and nuance in the five Suites distributed Fourth and Second on the first CD, Third and First on the second, and Fifth on the third that no-one involved – least of all we listeners – should be in any kind of hurry. On the other hand, they are not particularly concerned with yanking or surprising us if we have made up our minds about the nature and profundity of Forqueray's world prematurely. They simply play – with energy and elegance, clarity and charisma. They are fully aware of the need to infuse the essence of each individual movement with total concentration; yet they allow the harmonic and tonal structures of the works to suggest the progression and purpose that unite the Suites. It becomes impossible to miss this direction the further we get into this magical world. The 32 pieces presented here are arranged into five Suites by key. Apparently – despite the aforementioned decline of the viol – this collection received much attention on its publication. Indeed, having been dedicated to Henriette, daughter of Louis XV, and engraved by Louise Leclair, wife of the composer and musician, the large volume which even bore the rubric "Volume I", suggesting that there was more to come, was made available widely at the most prominent publishers. The original manuscripts have not survived. It may even be the case that, as editor, Jean-Baptiste, did more than transcribe, preserve and reproduce the original harpsichord versions: he may perhaps even have made substantive changes – particularly, by his own admission, to the basso continuo parts; maybe even modified some of the score itself in order to make it easier to play… there are documents to this effect by Jean-Baptiste. The latter even admits to having had to "complete" the Third Suite himself. If this is indeed to be considered the work of father and son to some extent, there is enough stylistic continuity and integrity nevertheless to make the music both enjoyable and thought-provoking. In any case, their styles are sufficiently similar as to make attempts to identify who may have written and/or completed what both futile and unnecessary. It's a testament to the richness and originality of the genre that you're quickly drawn into a world of textures which are on the challenging side of the happily familiar without being perverse in any way. The acoustic (that of the Temple Bon Secours in Paris) is warm, close and intimate – completely appropriate for this music. There is one small blemish, then the audio gap between tracks one and two of the first CD is too evident. Otherwise, the sound of the recording is just what we need to be drawn into this music. Breathing and the close handling of instruments are also to be heard; though they in no way detract from the experience. There is a four page essay setting out some of the background to the recording and in particular its music's probable real origins, about which – as said – there is doubt. As well as an examination of why Jean-Baptiste Forqueray chose to issue his father's work in versions transcribed for harpsichord as well as for viol and basso continuo. There are scattered other CDs featuring the music of the Forqueray family and a variety of transcriptions. But this is the most complete. It's surely destined to be one of the most successful, and pleasing, collections of Antoine Forqueray's music available and should be snapped up by anyone wishing to learn more about a seriously underrated composer of music that is original, beautiful, profound and highly stimulating. It may appear to someone otherwise unfamiliar with the period and repertoire as though it's likely to be of limited scope. Far from it. 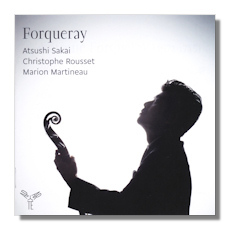 There are whole worlds here and the insight, technical strengths and interpretative reach of Sakai, Martineau and Rousset – not to mention the generous amount of music packed onto the CDs – mean that this set is very warmly recommended.